Medical Supplies & Medical Equipment Information: I am not sure how to tell what is thermal without loading it in the machine. Is there a quick way to tell the difference? I am not sure how to tell what is thermal without loading it in the machine. Is there a quick way to tell the difference? There is a simple way to tell the difference between a roll of medical imagining paper and a roll of thermal paper. Since thermal paper has the ink already applied to the surface of the paper, just mixed with a acid and a chemical compound to keep it invisible, you don't have to load the paper into a machine and run it through the printer. All you need to do is apply a heat source to the paper to allow the surface treatment to melt and the acid and dye to mix over the heat, creating the distinctive black ink marking. Hold the paper above a disposable lighter or other heat source. The surface of the paper should appear shiny, almost waxy, for just a split second and then it becomes dark. Don't apply the flame too close to the paper or all you are seeing is a burnt area. Regular paper, either on a roll or in sheets, will not have any discoloration over a clean burning flame. Does thermal paper resist fading for long periods of time? Thermal paper, with its chemical reaction that causes the image, is much more resistant to fading than regular printer ink or data produced through a laser printer. However, even thermal paper will fade over time. 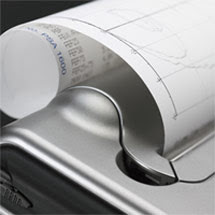 Most manufacturers indicate that thermal paper will resist fading for up to seven years, most indicating between five to seven years before noticeable fading occurs. There are some storage strategies that help reduce fading. The most obvious one is to keep the thermal printer image or data out of continuous or direct light. A piece of printed thermal paper will retain the image or data much longer in a file than sitting on a desk or in a binder that is opened continually. In addition ensuring that the paper remains dry and out of humid and moist environments also helps prevent fading and aging. What is the most economical way to buy thermal paper in both sheets and rolls? Buying in larger quantities and buying cases instead of individual rolls or packages of thermal paper is always more economical. In addition keeping an eye out for discounts and reductions on various websites can help to cut your paper supply costs. Many of the bigger medical suppliers that offer thermal paper have a huge variety of packages, case sizes and even number of sheets per unit, allowing you to compare between different companies. Just make sure that you check the fine print and know the specific size and amount of the package, unit or case you are ordering. Different brands and manufacturers of the thermal printers also may require specific brands of paper, which can make purchasing generic types of paper out of the question. Always carefully check the equipment to ensure the paper is compatible.